Adapted from the article Are You Ready to Be the Answer to the Prayers You Pray? 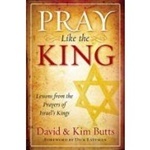 by Kim Butts, co-author of Pray Like the King: Lessons from the Prayers of Israel’s Kings. This book is available at prayershop.org. Use the code CONPSP3 at checkout to receive an additional 10% discount.